If you decided to get a new bathtub, you probably already know that it’s not that easy. The problem arises once it comes to choosing a new bathtub shape. But the most important thing is to find the right material. If you choose something that doesn’t completely meet your requirements, you’ll never be really satisfied with your bathroom renovation. A good bathtub has to be durable and have a long service life. It should also have a smooth surface and be resistant to any negative impact. The tubs can be made of different materials having specific features and peculiarities. How to make a good choice? Let’s go over the most popular options. The advantage of choosing this material is obvious: it’s plain but is as safe as houses. Such bathtub will serve you for a long time requiring no special care. There are no limitations on the choice of cleaning agents. Cast iron is also known for its low thermal conductivity and ability to keep the water warm for a long time. There is only one lack that cast iron has: it’s very heavy and its transportation takes time and effort. This is a durable material and it’s very easy to refinish its surface if it’s damaged. Also, steel in much lighter in weight than cast iron and it’s not a problem to bring a steel bathtub into the house. Additionally, it’s cheaper in price. It’s a great choice for those who want to save some money. However, steel has a high thermal conductivity and water in a steel bathtub gets cold fast. You surely won’t be able to enjoy your late-night bath as loud sounds of pouring water will make it impossible. Your family members may get frustrated with that fact as well. 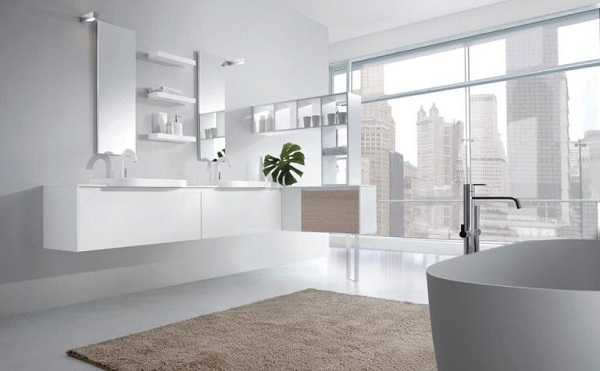 The main advantage of shopping for acrylic bathtubs is their wide price range. No matter what price you are looking for, you’ll be able to find a good option for yourself anyway. You will also be able to choose a bathtub of some non-standard shape or color. Acrylic bathtubs can be easily painted in any color. Such bathtubs also have light weight and low thermal conductivity. The only disadvantage of purchasing an acrylic bathtub is the fact that you will always need to carefully choose your cleaning agents as the wrong ones can damage the surface badly. If you are not sure which bathtub to choose, please, don’t hesitate to contact us. We’ll provide you with all the necessary information during the consultation and help you get a bathtub model that will perfectly match your bathroom design and meet your needs.